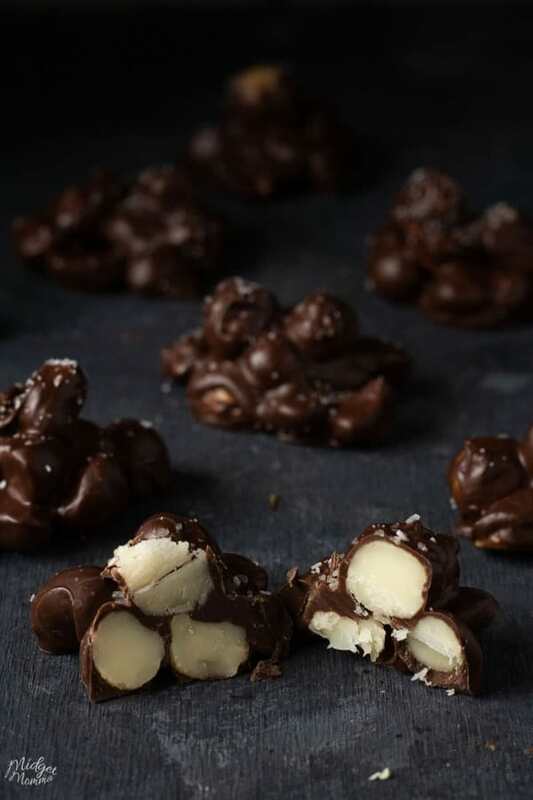 Our Keto Chocolate Covered almonds were such a hit that we figured it was time to make another tasty chocolate nut treat and came up with these super tasty Keto Chocolate Macadamia nut Clusters. 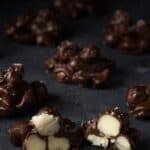 Chocolate Macadamia Nut Clusters are the perfect keto sweet treat for when you are wanting a little chocolate goodness! Macadamia nuts have been my favorite nut for as long as I can remember. I remember being a kid in the grocery store, and while other kids asked their moms to buy them candy I always asked for Macadamia nuts. When I learned that eating Macadamia nuts is great when you are on the keto diet it was a total win for me. 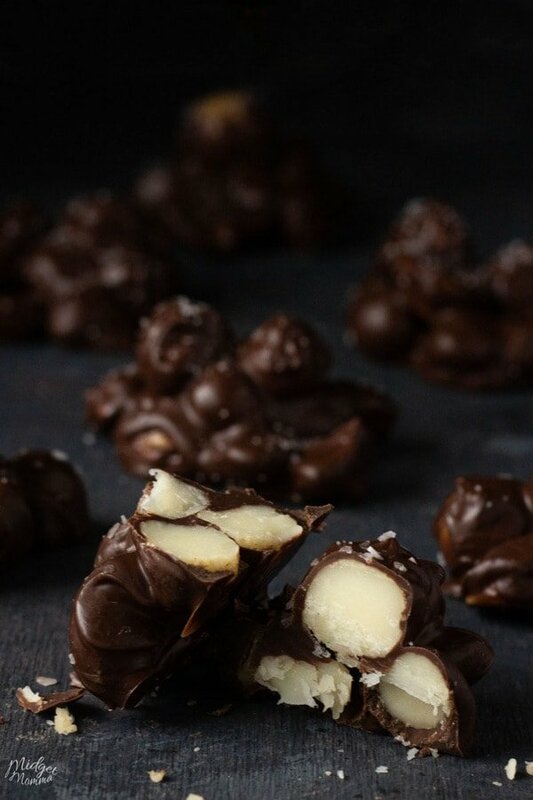 These Chocolate Macadamia Nut clusters are the perfect low carb chocolate treat. I know the Keto Chocolate almonds are a favorite of many people. However these Keto Macadamia nut clusters are my favorite. 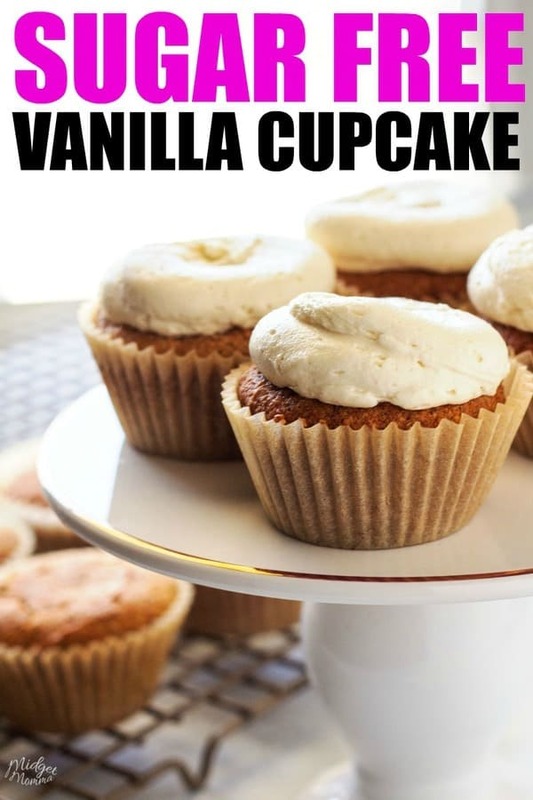 I like to make a big batch of them and then store them in the fridge. They are perfect when I am wanting something a little sweet. I can just grab one and know that while having a sweet treat I am still sticking to my low carb way of eating. My favorite brand to use is Hawaiian Mauna Loa Dry Roasted Macadamia Nuts & Sea Salt. 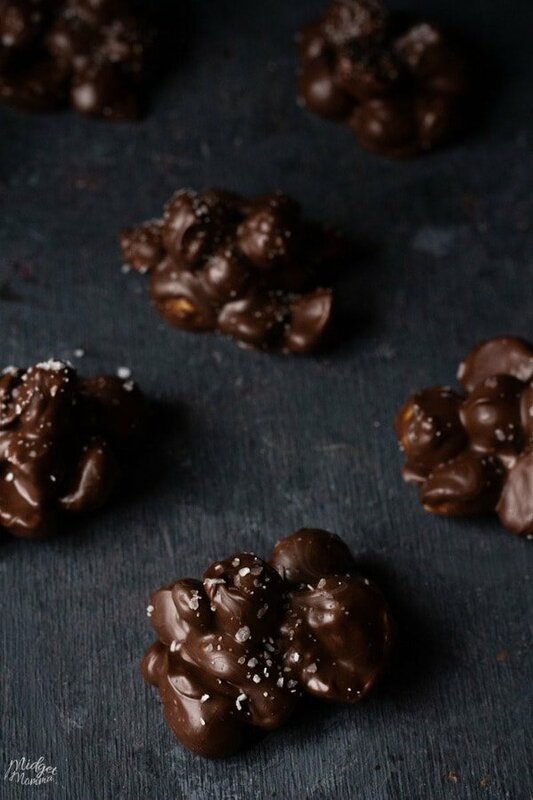 You can use any brand of macadamia nuts when you are making these Chocolate Macadamia Clusters. 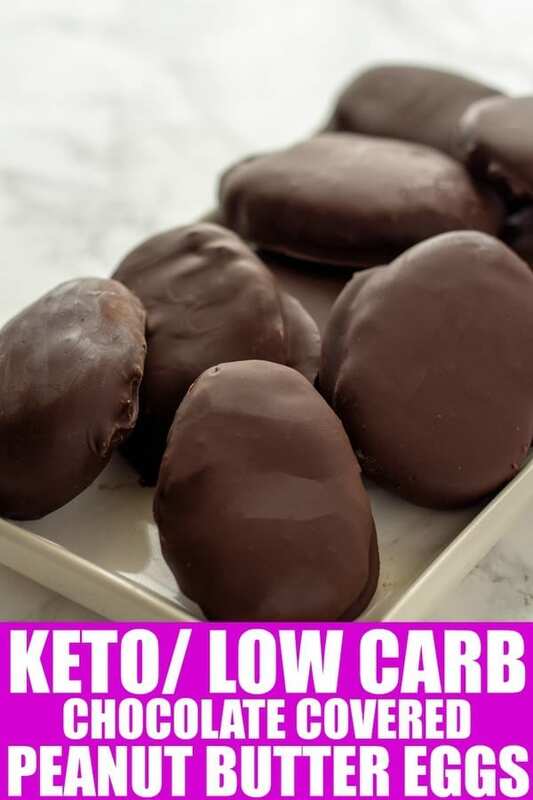 When you are making these you are also going to need a low carb chocolate. My personal preference is Lily’s Chocolate chips. Since you are using Lily’s Chocolate chips there is no sugar so you need to subtract the fiber and the Erythritol when you are figuring out the net carbs. The net carbs for these Chocolate Macadamia Clusters is 2.6g net carbs. 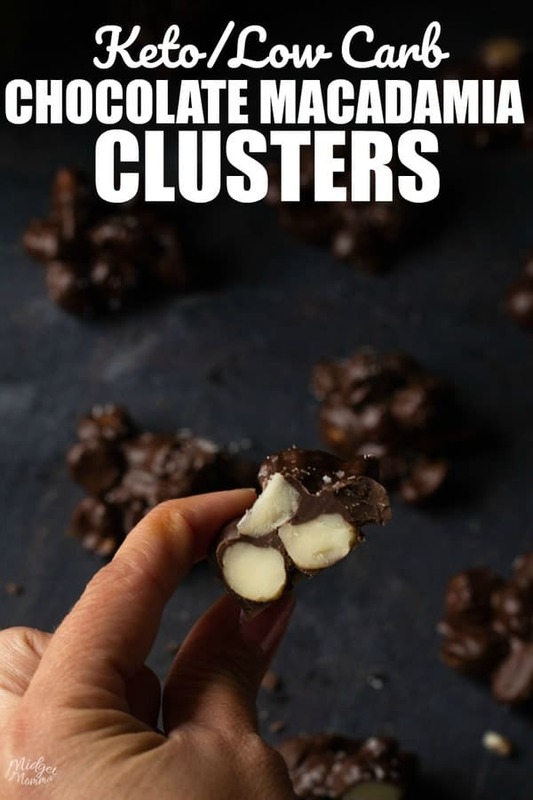 (11g total carbs – 3.4g carbs from Erythritol – 5g carbs from fiber = 2.6 net carbs) when you make 10 clusters. These super tasty Keto Chocolate Macadamia nut Clusters are perfect for when you want a low carb super tasty treat. 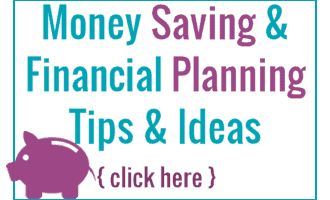 Easy to make, and done in less then 10 minutes! Get a large microwave safe bowl and place the chocolate in it. Microwave on high in 30-second intervals till the chocolate is fully melted, making sure to stir after every 30 seconds. Once the chocolate is fully melted toss the macadamia nuts with the chocolate until they are completely coated in chocolate. Scoop the macadamia nut mixture out a tablespoon (5 macadamia nuts per scoop) at a time onto a parchment lined sheet pan. You want each cluster to have 8 macadamia nuts in each one. Sprinkle the top of the clusters with the salt. Place in the refrigerator for 30 minutes to cool set the chocolate.Store in an airtight container for up to three weeks. 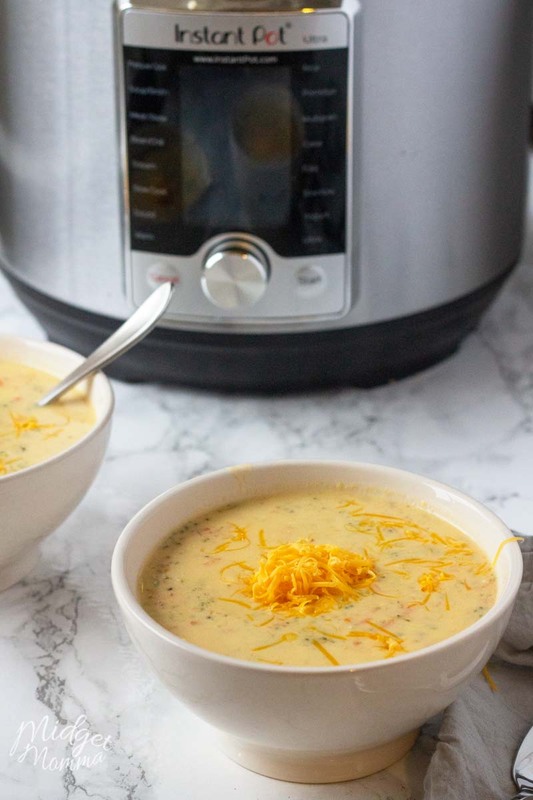 More Keto you will love! 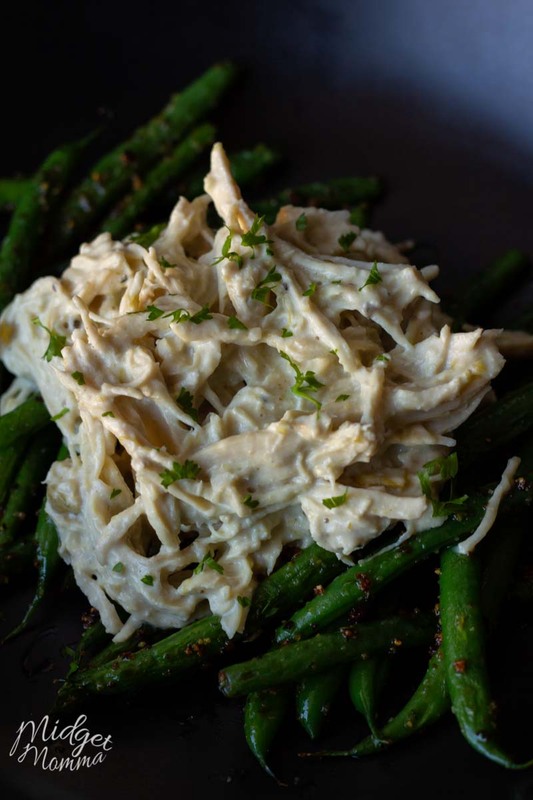 Keto Avocado Recipes. 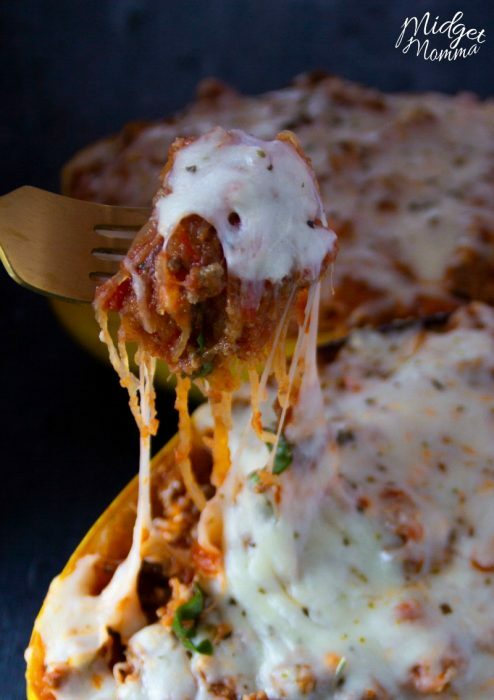 Tasty Recipes that all have avocado! Low Carb Starbucks. All the tasty drinks you can get at Starbucks that are low carb! Low Carb Taco Bell. Tasty foods that you can get at Taco Bell that are low carb and keto that will fit in your keto and low carb lifestyle.